Student Government Association considered 15 applicants for membership Sept. 19, and after a meeting longer than two hours, the organization welcomed 12 new members and almost doubled its population. Aguilar hopes to bring a fresh perspective to the organization. 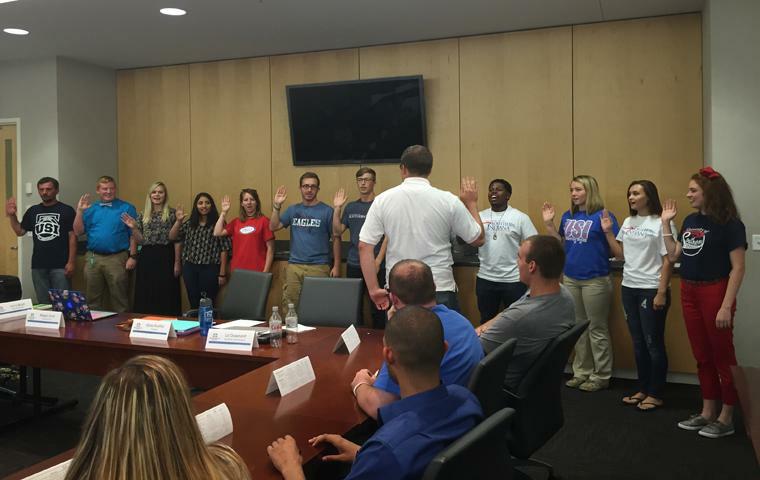 Aguilar is one of six freshmen welcomed into SGA this semester, along with eight new upperclassman representatives. At the meeting, Executive Vice President Liz Downard led the potential members out of the room to await consideration by the existing members. The candidates were individually brought back into the room to introduce themselves and answer any questions the existing general assembly had. SGA initiated six freshmen members-at-large, two liberal arts representatives, two business representatives, a Veterans’ Affairs Representative and an International Student Representative. Undecided freshman Tess Whitesell said she involved herself in high school leadership as much as she could. While some freshmen were previously involved with student leaderships, others said SGA would be their first experience in student leadership organizations. President Alexa Bueltel said SGA looks for students who want to make a change on campus and are passionate about what they do. While new members see her in the highest position, Bueltel was in their shoes several years ago. Bueltel attributes the significant number of interested candidates to “a combination of things” such as the SGA Welcome Dinner during Welcome Week. With members that avidly promote SGA to friends on campus, Bueltel said they “hit the ground running” this year.